I consider myself very lucky to be a working mom, but also get a taste of being a stay at home mom during the summer. This summer Claire is old enough to do a few classes through our recreation department. Our mornings include an hour at the gym then me getting ready as quickly as possible so we can head to whichever class Claire has that day. As they are all parent-child I get to dance around, too. Comfort is key and so I've been reaching for bright colors and patterned items to keep my outfits interesting when I don't have much time. This top I got a while back from Tulip is fitting the bill! 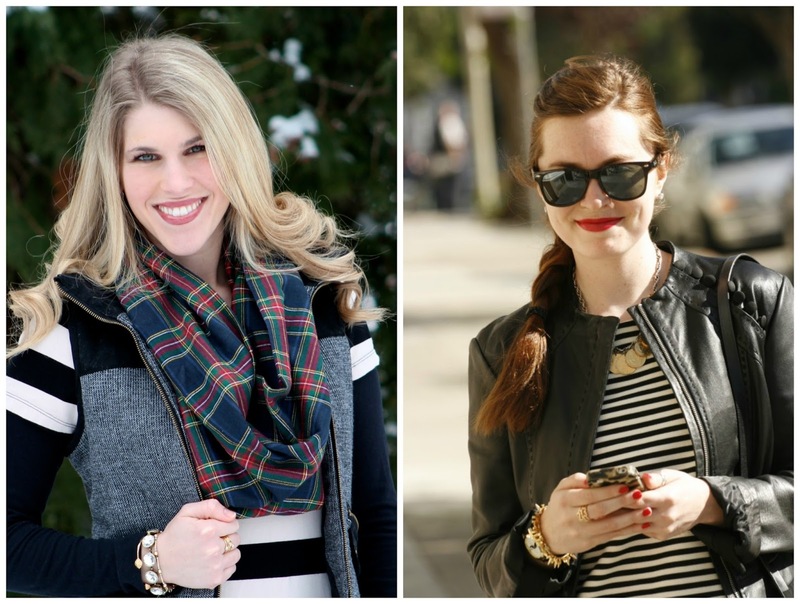 See how I styled it two ways here. Today Chelsea from Ginger Side of Life is co-hosting. Chelsea's blog is filled with breathtaking travel photos that is sure to make your travel bug start to itch and fashionable outfits. How she manages to look so put together and stylish while traveling I am still trying to figure out! Hop on over to her blog and join her in her amazing worldwide travels! 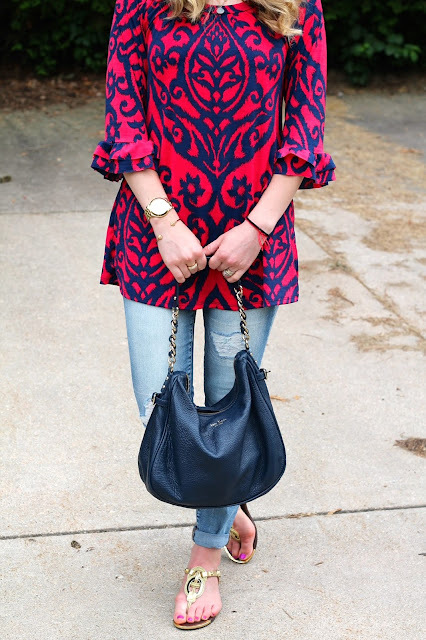 I love the ease of a tunic! Yours is stunning with the vibrant colors! I love the tunic. The colors really pop and are perfect for these summer months. I also love that you added a hat with this outfit as well! I love your bright and fun tunic! love the red + blue! I often forget the greatness of primary colors. I love that printed tunic, lady! So fun! That top looks comfortable and looks perfect for an afternoon with activities with your daughter! I really like the bright color and pattern, so pretty! And, way to go in getting some gym time in each morning! This blouse is so pretty, you look stunning! What a cute fun top! Adorable with the chic hat! Thanks for hosting! Glad you and Claire are enjoying your summer time! 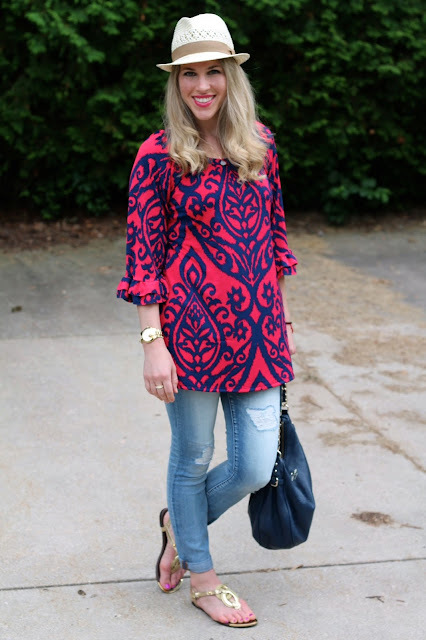 That tunic is so fun! I Love those pretty sandals and hat too! love the pattern! so unique and stylish!thank you fro hosting the link up! Great outfit, Laura! I love that gorgeous top as it feels very summery and sophisticated at the same time. such a fun outfit for on the go. I am absolutely smitten by the tunic you are wearing Laura!! The colors, prints and the style are right up my alley and beautiful on you!!! I love this top on you- perfect for looking so chic and mom ready! Love this look! You look so cute! Love the intricate prints of the top!!! I love this top! The bold pattern and colours are amazing. Such a striking pattern on the top. It's really eye-catching. And I love the trilby style hat. I have a similar one, as you can see! The whole ensemble is casual yet chic. I love bold colors of your tunic - very cool! Thank you for the link up. What a cute top Laura! I love the design on it and way you styled it for summer dates with Claire. Thanks for linking up to "Bloggers WHo Have Inspired Me." Very fun top here, love the print and how you styled it. The bright colors are perfect for summer! I love the ruffles around the sleeves, they add the perfect touch. Enjoy the summer months home! Sounds like a really fun summer with Claire! 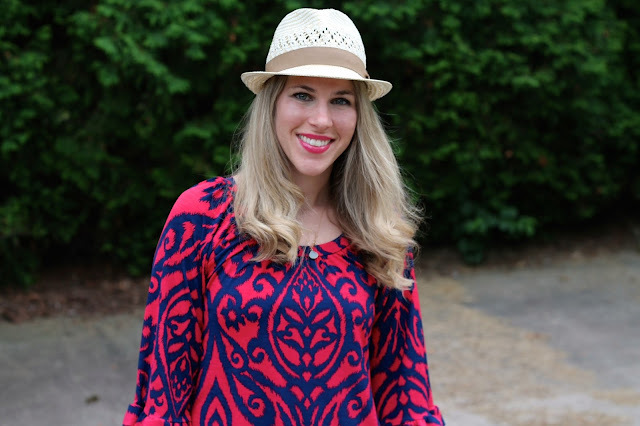 Your bright top is perfect for the Create28 Challenge I'm co-hosting this month. Today's theme is "brights" :) I would love it if you would link this look up with us on Monday! Love your tunic. My mom was a teacher, and I always loved getting the summers with her. Glad you are enjoying it! I absolutely love this look, Laura!!!! You look amazing! You look great in a fedora and omg, this tunic is stunning. Love it! I do love flowy tunics for the summer! The best benefit of working in the school system is always getting summers off, plus you will always have all the days off your daughter does - so convenient! Your tunic is gorgeous Laura! I love the look with light jeans! So cute and perfect for your summer days with Claire. 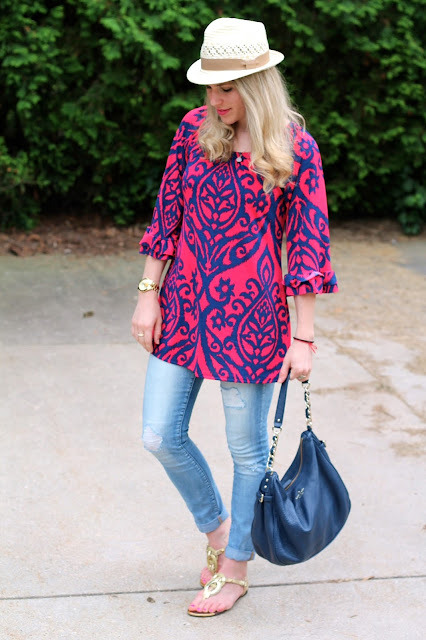 What a pretty tunic! Love the colors and print--it looks great with the gold sandals too! Love your tunic and hat. The print is gorgeous! I love that ripped jeans are back in stye. Cute! What a pretty top! So fun for summer! Great outfit! I love the color combo and print of your top! Great outfit, I love the colors and the red looks gorgeous on you! 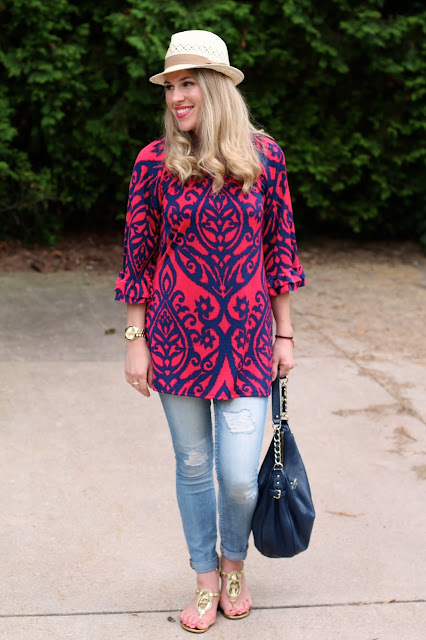 I remember this pretty tunic the last time you wore - the colors are so pretty!